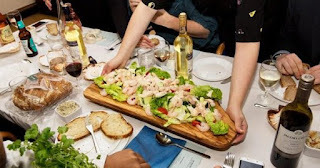 On Saturday 24th November Gills Gills Gills are hosting a sustainable seafood supper club at Quaggy Cafe in Greenwich. Tickets cost just £27.54, and for that you get 'a plaice at the table' with a three course dinner, including 'On The Rocks Fish Pie', their main course. Sounds great! "We are excited to be coming back to our favourite plaice in Greenwich with another of our seafood suppers. If you haven't joined us before these evenings are a great chance to tuck into a three-course meal of delicious sustainable seafood, catch up with friends and best of all it's BYOB. The format is a sharing dinner, with large group tables and a chance to get to know your fellow diners. If a night of food and wine wasn't enough of an excuse, the money raised is in aid of local charity, Quaggy Development Trust. Quaggy provide incredible support to children, families and residents in the local area. Delivering childcare, counselling services and activities for over 60s amongst other hugely important services."